While the anticipation for the official grand opening of Rockwell Beer Company continues, Andy Hille’s team was getting into full form Saturday night, with what is described as the ‘first soft opening.” Billed as “Snow Ball: Snow Day Launch Party,” the event featured Snow Day, a start-up in St. Louis, exploring art + technology to create custom snowglobes using 3D scanning and printing. It also gave us a full-on glimpse on what we can expect when St. Louis’ newest and perhaps most uniquely designed brewery comes on-line. 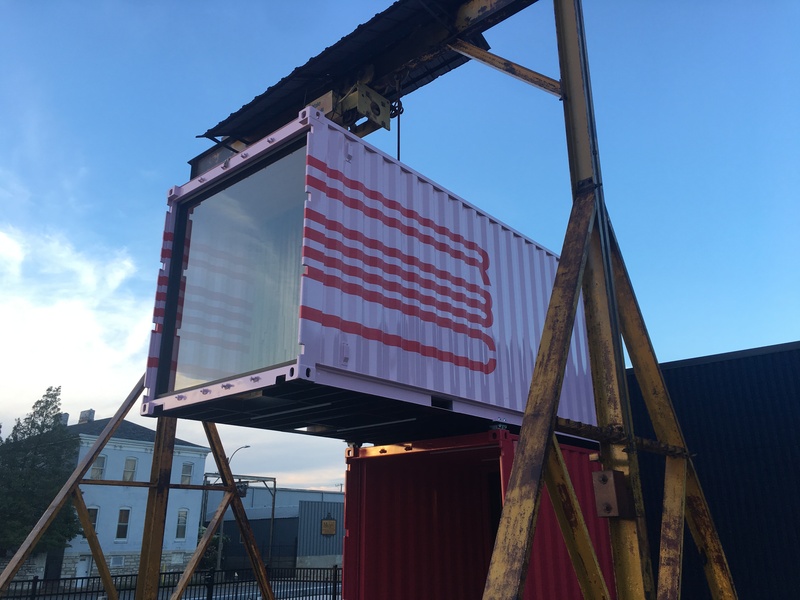 Aside from the beer they will make, you will not forget the site of shipping containers stacked strategically, creating a modern, hip and industrial look that is both cool and inviting. The slow rollout of the actual brewery did not prevent Rockwell from brewing beer or getting it in front of people. Thanks to its friends in the industry and its presence at beer festivals, Rockwell became a staple along with already established brewers. Hille’s brewing journey began as at birth. Born in Ft. Collins, Colorado, his uncle ther was a barley breeder for Anheuser Busch and many of his family’s friends worked for Odell Brewing. As a family, Hille grew up inside the brewing community. As a young adult living in Chicago, Hille experienced the “when one door closes, another door opens” phenomenon. Already a volunteer at Finch Brewing Company, Hille was laid off from a paying job in 2011. But he turned that position at Finch into his future, working his way up to a fulltime job in packaging, where on his first day, when his manager was injured on the line, Hille was promptly named to the position. In 2012, Hille left Finch and moved with his wife back to St. Louis. On the third week of October 2012, he reached 0ut to Perennial’s Brewmaster and Co-Founder Phil Wymore, who also got his brewing start in Chicago at Goose Island and Half Acre Beer Company. He simply asked Wymore if needed any help with his brewery, which opened just the year before. Luckily, Wymore said yes, and Hille joined a growing family tree of future St. Louis brewers. His first job was brewing as an unpaid intern, but that quickly evolved to part-time and eventually full-time positions. At the time, the Perennial team was made up of Wymore as Brewmaster, Head Brewer Cory King, and brewers Jonathan Moxey and Hille. After 4 years as part of the Perennial team, Hille began forging his own plans, eventually leaving Perennial in July of 2016, just a few months after announcing Rockwell would become his new creative outlet. Since the announcement in 2016, the excitement that followed was enhanced by the people who already knew him from Perennial, but now he’s nearly ready to branch out. “We want to touch new markets and underutilized demographics that understand beer that speaks to them. There is a lot of people that appreciate a good drink,” said Hille. To help build those bridges and connections Hille has re-teamed with his former colleague at Perennial, naming Jonathan Moxey as head brewer. But even with the ultra-cool brewery design, the beer is what Hille hopes will make Rockwell unique. He feels confident in brewing in lots of styles of beer that he hopes will be approachable and progressive. “We will not have any flagship beers and will keep rotating our menu. If we have a beer people love, we’ll just make more. We will be flexible, quick, and agile,” said Hille. Fun will be the order of the day at Rockwell Beer, but this team is very serious about their beer. “We pay attention to the smallest nuances to any beer. We want to try to mimic that water profile, provide a good foundation, use good ingredients and good processes,” said Hille. We can expect innovations from Rockwell Beer for sure, but also beer that will stay true to the style. To the team, brewing comes first, gaining knowledge everytime they brew and learning the quirks. To lead off, Rockwell will launch with three beers, according to Hille. The first beer brewed for their first event back in 2016. Described as a Saison brewed with mandarin oranges. Named for a fictitious pet llama, it’s Rockwell’s’ take on a more approachable Belgian style wheat beer, but with a twist. Fruit forward but not too fruity and not too hoppy. This dry hopped, rye pale ale is brewed in partnership with local chicken restaurant Byrd and Barrell and brewed to be a friend of chicken, with the rye representing the spice. The beer is low on bitterness and has a bit of citrus and piney from the hops woven in. Built for balance and to be approachable. A Double IPA. More intense, fruit-forward featuring Mosaic and Motueka Hops from New Zealand, which is a very lime forward hops. The idea was to go big and citrusy, but no citrus involved. 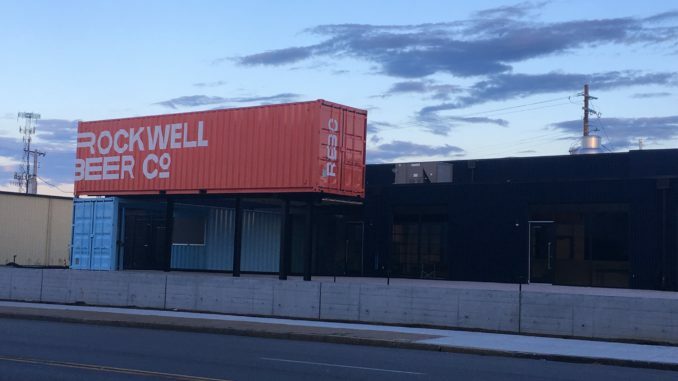 Rockwell Beer is located at 1320 S Vandeventer Ave, St. Louis, MO 63110. The official opening date is still to be determined.